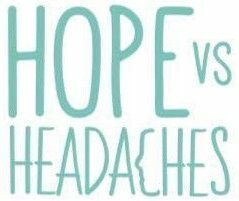 2 Comments on I am NO longer classed as a “Chronic Migraine” sufferer! Oh my god! I actually did it! Deep down I always knew I would, but my god it’s been a tough old process to get to where I am today. Tough is probably a bit of an understatement actually. There were endless times when I used to question myself and whether I could beat this illness but the theory I lived by was that for the majority of my life I had lived completely migraine free, so surely there was no reason why I couldn’t go back to my life before? I had caused this illness so I must be able to reverse it, right? I truly believe everything happens for a reason and this was my body telling me to stop abusing it, take a long hard look at your life and to slow the heck down Christie! It only took me four years but I think I might have finally cracked it. It’s funny isn’t it but we all believe that our healing lies in the hands of others as that’s what we have grown up to learn. We trust what the man in the white coat tells us and we hang onto his every word as that’s how it works in society. When the treatment fails we find another man in a white coat and pray that he can deliver the correct pill combination that will magically cure our condition. So after conventional medicine failed me and I had lost count of the number of specialists in white coats I had seen, I decided that it was time to heal myself as no-one else could do it for me. I had lost my belief in the whole medical profession which was probably half the problem actually. Belief! I’ll come back to that one later on… Anyway, from that point onwards I read hundreds of articles and books on self healing, mind and body connection, meditation, diet, lifestyle, holistic healing methods, the list goes on. So I made it my life purpose to heal myself without any drugs, injections or pills. It’s not been easy but let me share with you just how I got to where I am today. Now this might seem totally ridiculous and you’re going to say “how can I be grateful for being in this much chronic daily pain”? I know, I totally get it, but trust me on this. Life works in a funny old way and as soon as you are grateful for what you have in your life, even more will come your way. Start small though. When I was at my worst this is what I started with.. “I am grateful for the roof over my head, for the family who love me and for the comfy bed I have to sleep and rest in”. Over time as you begin to heal these will change to bigger things and before you know it you will be saying “thank you for this pain free day”. Now I’ve put this in capitals for a reason as it’s what has made the biggest impact on my migraines. After doing some research with the migraine community and compiling a list of the most, through to the least, common food triggers, I came to some realisations. The main triggers were processed foods, meat, dairy, gluten products, refined sugars, chocolate and coffee. So after taking all these out of your diet what is left? A plant-based diet! Have you ever heard anyone say they got a migraine from spinach? Or kale? Or sweet potato? No, exactly. The more I researched this, the more I learnt the anti-inflammatory properties it can have and how it has helped to heal a wide range of conditions from reversing heart disease, lowering blood pressure and improving or reversing diabetes. There are several documentaries you can watch on Netflix if you want to find out more about a plant based diet and its health benefits. So I gave it my all and went in head first and essentially became vegan, and the results have been astounding. I would say my migraines halved in severity and intensity within maybe three weeks! Give it a try yourself, what have you got to lose? So if you have followed my blog then you will know that through committing to Dr Joe’s daily meditations it has hugely helped me to get out of the vicious chronic pain cycle I was in and take steps forward to recreate the life of my dreams. See, the unconscious mind and the conscious mind doesn’t know the difference between visualising something and actually doing it, so the same pharmacy of chemicals is made in the brain to create exactly what you have been visualising. Makes sense? Essentially you are reprogramming your brain and I have been doing this for over a year now on and off. For me I know this has played a huge part in my recovery and if you want to find out more go to http://www.drjoedispenza.com. I have found this to be the key factor to any kind of healing, no matter what the illness. There is an amazing book out there called “Mind Over Medicine” by Dr Lissa Rankin that opened my eyes to how important our belief actually is in regards to healing our bodies. If we are given a positive diagnosis by a doctor, we believe this, but if it’s not the case and we get a negative diagnosis, then we also believe this. In Dr Joe Dispenza’s book “You Are The Placebo” there was a case whereby a man got sick, the doctors told him that he was going to get worse, so he did. Then the doctors told him he would get better, so he did. And finally they told him his disease was back and it would kill him. Guess what… it did. What was found later on was that the doctors had made a mistake and his disease wasn’t back after all. But his belief in the doctors and their words actually killed him. His belief killed him! Can you see how incredibly powerful your belief can be? In terms of migraines what I am trying to explain is that if you believe there is no cure then there won’t be, and if you believe that you can take steps to heal yourself then you will be able to. As Theodore Roosevelt said “Believe you can and you’re half way there”. I used to be someone who always thought the worst in any situation. I was an avid worrier and I lived constantly in an anxious state. After reading so many books on the power of the mind and the Law of Attraction, my attitude has changed and as a result of this my life has changed. Instead of expecting pain, expect health. Also try not to talk about your pain 24/7 with others as what you think about you bring about and you will only get more of it. I told all my family and friends not to say the M -word or ask me how I am feeling. Funnily enough it allows you to focus on other things other than pain which in turn makes you feel so much better. So overall, this combination has brought me to where I am today but only through a lot of trial and error and I’m not going to lie to you, it hasn’t been easy. There have been many tears along the way together with some amazing highs but some very hard lows but my goal throughout has been to inspire others that hope is not lost. I want to be an example that there is a way out. I have my quality of life back now and I am now proof that healing IS possible. I understand everyone is different and so are everyone’s migraines which is why they are so hard to treat, but if my story can help you find even a little relief then that would be amazing. I’ve been there and I know how desperately hard it is to be suffering day in day out in relentless pain feeling hopeless and lost. I hope my story inspires you to even just believe that change is possible and upon completing my holistic nutrition course to become a Health Coach, my dream is to help others suffering with health conditions focusing on chronic migraines. So after feeling better than ever and only suffering one tiny migraine in a four week (1 month) period, it occurred to me that perhaps I no longer fall under the umbrella of a chronic migraine sufferer? And do you know what… I was right! Congrats! My Migraines are a bit lessened since I got the Daith Piercing, but I have realized stress is a major trigger. .I am working on eliminating or cutting that down, now.